England fans were sure hoping for a win, but sadly, Croatia beats England in a nail-biter the World Cup Semi Final game to advance them the 2018 FIFA World Cup Final! The England team were so close, with only one game away from a 2018 World Cup final match against France. However, that glorious occasion didn’t happen this year when Croatia beats England 2-1 in overtime to advance on Wednesday evening. Kieran Trippier scored the first goal for England on a free kick within the first 5 minutes of the game putting England on the map. Croatia tied the match when Ivan Perisic scored an equaliser against England in the second half, forcing the game to go overtime. In overtime, Croatia’s Mario Mandzukic fired the ball past Jordan Pickford to score Croatia’s second goal and seal the victory. When was England vs Croatia World Cup Match? England and Croatia played on Wednesday, July 11. This 2018 World Cup Semi Final match will kick-off at 7pm. The 2018 World Cup Final will now be Croatia vs France on Sunday. How many times has England been in world cup final? Surprisingly, England have only been in the FIFA World Cup final once before. Of course this is the reason why England fans were so excited and praying that England would beat Croatia in the World Cup semi final is because it will be only the second time in history. So, new history is set as Croatia beats England in this historic game for them. England was looking for a second turn, having only reached a World Cup Final was in 1966. See more details on that 1966 match here. In that World Cup Final, it was Geoff Hurst and Martin Peters who scored for England, but Germany was able to equalize late in the match to take the game into extra time. Of course it was none other than Hurst who was able to seal the deal with his famous hat-trick to bring home the victory. The England and Croatia football teams have played 7 matches. Out of those 7 matches, England beat Croatia 4 times, Croatia had one win and 2 games were draws. The England 2018 World Cup football squad knew the talent they were up against. First off, there was Luka Modric who has built a solid reputation as being one of the world’s best midfielders. He was flanked by two super talents from Real Mardrid, Ivans Rakitic and Perisic which were just too strong for England. There was also some history between these two football teams. It was in 2008 when Scott Carson clumsily fumbled a strike from Niko Kranjcar that ended up in his own net. That mishap caused England to miss out on the Euro 2008. Looks like Croatia has again taken away England’s dreams of reaching the 2018 World Cup Final. The odds were in England favor however the final result that Croatia beats England and advances to the World Cup Final, is no doubt a relief to most of the online betting sites and bookmakers. England actually went into this match with a scoring lead with a combined score of 9-2 overall. What was the Pre-Match team news? For England, as expected, we saw the same team on the field that played in the England – Sweden World Cup Quarter Final match last weekend as there were no pre-match reported injury concerns. On the Croatia side, they were feeling some nerves going into the game with the uncertainty surrounding the fitness of both Sime Vrsaljko (the right back) as well as Danijel Subasic (goalkeeper). Most online betting experts and tipsters had this 2018 World Cup Sem-Final match as tight game. Bookmakers and sportsbooks had England as the favorite to win. So the news that Croatia beat England in Word Cup semi finals was only a bit of a surprise. Our Prediction was for England to beat Croatia in the World Cup Semi Final with a Score of 2-1. Looks like it went the other way and Croatia beats England to advance to the finals. 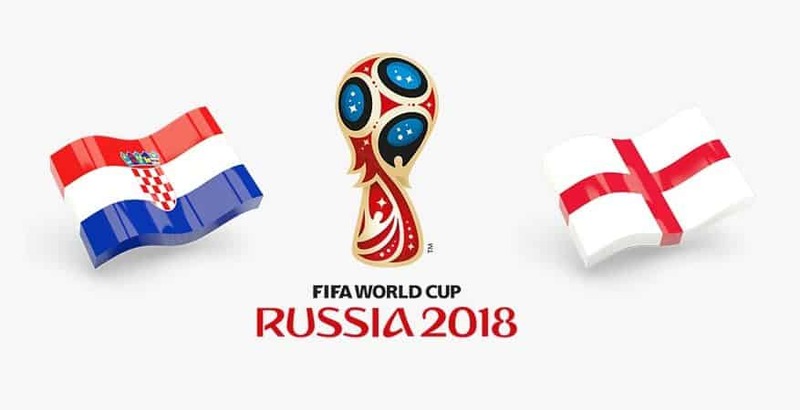 If you want to bet on the 2018 FIFA World Cup Final between France and Croatia, check out our sports betting section for some recommended sportsbooks and bookmakers. Where was the England vs Croatia Match being played? The FIFA Semi-Final between England and Croatia was played in the Luzhniki Stadium in Moscow. The stadium has capacity of 80,000. The venue was also the stadium hosting the 2008 Champions League Final between Manchester United and Chelsea. What TV Channel was the England vs Croatia Semi-Final on? Live stream FIFA World Cup matches? If you are in the UK, you can live stream the World Cup Matches on ITV player on desktop, mobile or a tablet. If you are not in the UK, you can access the ITV channel through a UK IP provider service.